I first noticed it late one December evening. The little girl I was babysitting for had fallen asleep during her bedtime story and I sat next to her, legs outstretched on the bed, trying to devise a way to exit without making any noise. Staring at my feet I realized that, although I could feel my legs, I wasn’t feeling my toes. 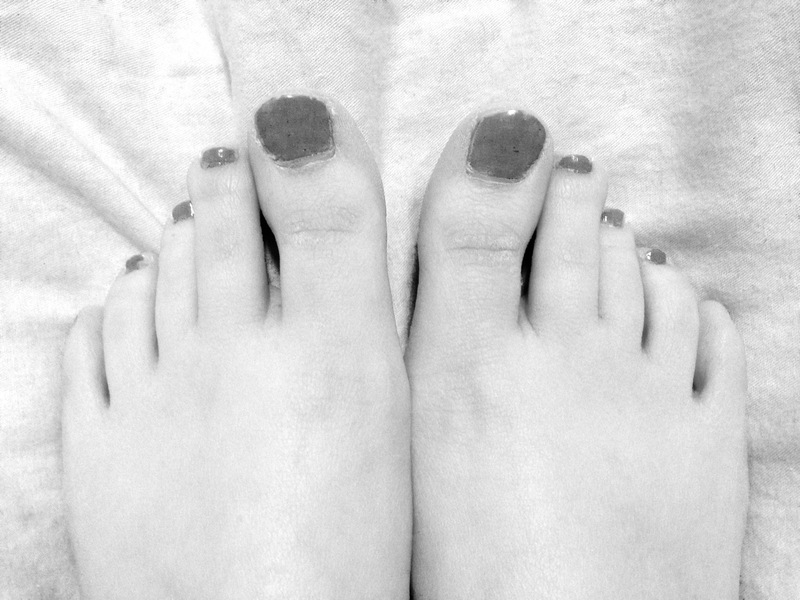 I moved them back and forth against one another, and the movement was there but I lacked the sensation that had been so obvious up until this point; I normally had extremely ticklish feet. After going home and running my feet under hot water, doing various stretches, and attempting to tickle my toes with my fingernails, I conceded that at some point I’d have to get this checked out. Although my doctor tried different means of treating my unfeeling toes, as the weeks passed the only change was more uncomfortable tingling in my feet. The desire to numb yourself of emotions and pain manifests itself differently in those trying to escape that which they fear. Some numb themselves through shopping, others use food, entertainment, alcohol, drama, etc. The means with which we numb ourselves is a personal preference. What we try to numb ourselves from can be categorized as pain. What is painful to each of us, and what we fear, is also custom made according to the individual. But it all results in the attempt to use external things to numb inner discomfort. So how can we possibly let go of that which numbs us, when we would do anything to not experience the pain that we are trying to avoid? For me the answer came in the form of numb feet. Having these cold tingly feet have made me realize how glorious my highly sensitive, ticklish feet were, as well as how powerfully thoughts and intentions manifest into form whether we want them to or not. The numbness, although an attempt to escape pain, has turned out to be painful. My body is letting me know that its harmonious functioning is dependent upon my ability to accept and feel that which I experience. While some pain seems so overpowering that it may destroy you, in reality your consciousness is vast enough to encompass any experience it encounters. Not only can your witnessing self withstand the discomfort, but allowing yourself to fully feel it as it arises keeps you healthy. When pain is fully felt, it moves through you. When it is numbed, it lies dormant within, containing the power to disrupt every aspect of your life. Now when I feel discomfort, fear, or pain I say to myself, “I allow myself to feel this right now.” Although in just the past week my tingly feet have had improved warmth and sensation, one of the medical tests the doctor still has to perform will involve needles and will undoubtedly be painful. This I am afraid of. So I allow both my fear of the situation, and the pain of the experience as well. Because the ability to feel is not only a sign of life, but is itself life sustaining. Thank you Katie. You gave such a healthy way of seeing the situation. And thank you for following SWB. It is my pleasure Rita, and I appreciate your kind words! Thank you! And I love that idea, it really helps put the sensation of pain into perspective. Have you tried acupuncture. They use needles but they aren’t painful and it is a wholistic treatment, improving overall circulation. As you recognize the source of your numbness, a wholistic approach may be more beneficial than traditional western medicine. Oh, yes, thanks for following me. It is my pleasure. And yes, how wonderful you brought that up, because I’ve been going to an acupuncturist lately and she really helped me to understand the situation from a spiritual and holistic stand point. I’m feeling more normal now than in months! Nice piece Katie – when we venture into the darkness, we retrieve the light . . . If only we allow for it. Thank you for being an inspirational embodiment of that. I truly appreciate your kind and insightful words, they offer great courage for such a journey as this. Thanks! Good to hear from you. Have you gotten a diagnosis yet? Vitamin B-complex might help for the nerves. Good luck with your next medical test! It is so great that you mentioned that, you are spot on! My B12 was really low and after a few months of taking B12 I feel almost completely back to normal. Thanks for asking. Hi Katie, thanks for introducing yourself by following our site–we look forward to exploring yours–you are expressing such a beautifully grounded way of experiencing the world–thanks for sharing it with us. If you’re on facebook we also invite you to visit the RAXA Collective page. See you there! I will check out your page, it is great to be connected! I truly appreciate your kind words.